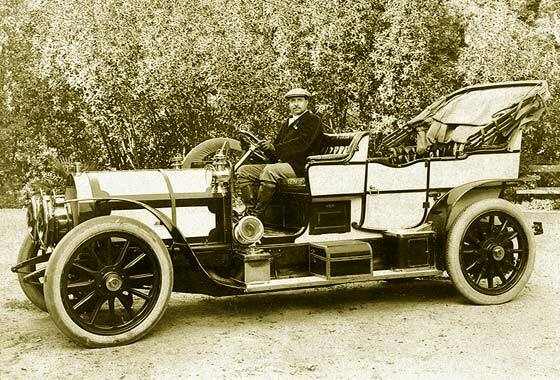 Another fascinating photo received from Joao Ferreira (Portugal) which shows the King of Portugal D. Carlos I, at the wheel of his new car. Not known if he learned how to drive but his younger brother Prince Afonso was an enthusiastic driver. Royal Palace had a preference for Fiats. -- Not Fiat, radiator cap looks Napier. Napier specialists Derek Grossmark and David Venables confirmed cca 1906 Napier L76 Touring Car, 6 cyl, 5,161cc. 99 examples were built 1905-1910. Chain drive was optional. Two photos received from Benjamin W. Bolger, History Teacher, Livingston High School,Thomas Edison National Historical Park, in West Orange New Jersey (USA) taken about 1908. Is it a White or Mors? He also had a Studebaker, a Lansden, a Grout, and a Pan-American -- Not a White. 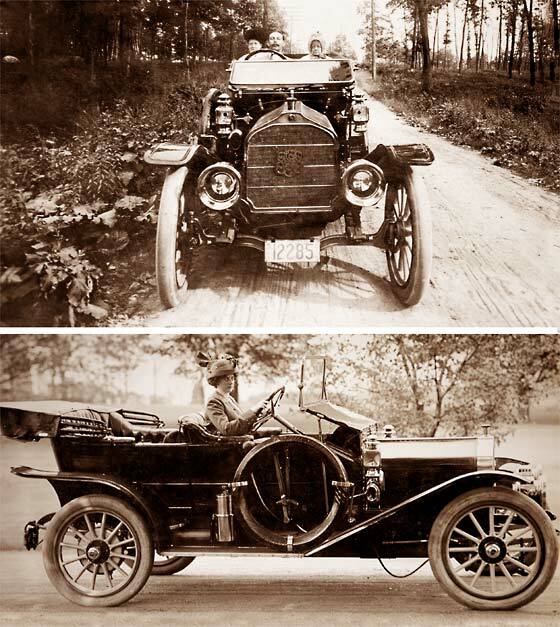 We think photos are of the same car separated by a couple of years, and a re-build/paint. This could well be a USA built cca 1906 American Mors made under licence by the St. Louis Car Co. in Missouri. Another fascinating photo received from Joao Ferreira (Portugal) of a "mystery car". 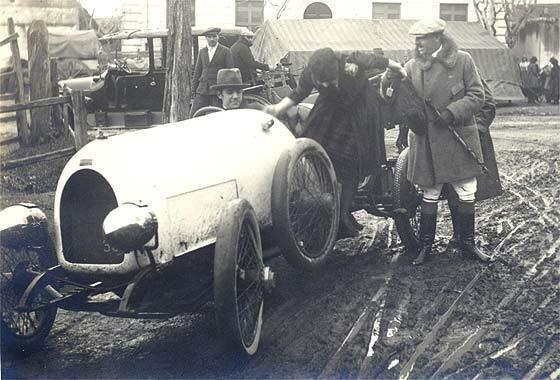 The legend on this photo mentioned that this is the car from the newspaper "O Século" that covered the "Raid Hípico" (horse race) of 1907. I suppose the car is a De Dion Bouton? -- Sure is. 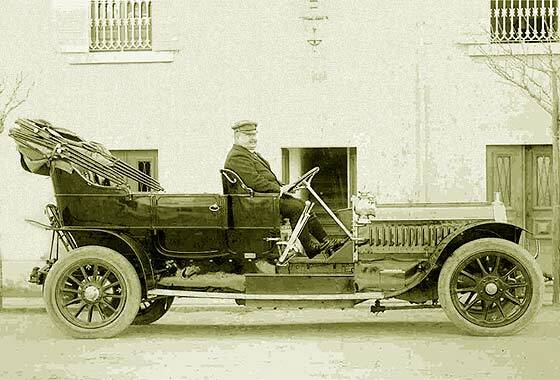 My thoughts were that it was a cca 1906 Rear Entrance Tonneau and Rory Sinclair confirmed it is cca 1907 De Dion Bouton Type AU, with a single cylinder 8HP engine and with the standard rear entrance tonneau body. Another fascinating photo received from Joao Ferreira (Portugal). 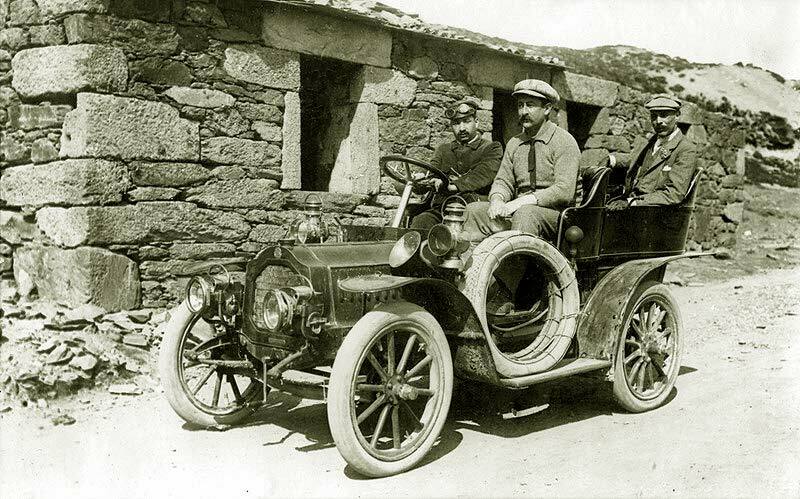 The legend on this photo says this is a Florência 40/50 hp belonging to the Visconde de Sacavém, one of the motoring pioneers in Portugal. -- Could not find any reference to Florência but there was a company in Florence, Italy, called FLORENTIA, 1903 - 1912. In 1905 they took on the Rochet Schneider licence (France) and in 1907 they started making the 40/50. These cars were also exported to UK, and cost £880 in 1908. 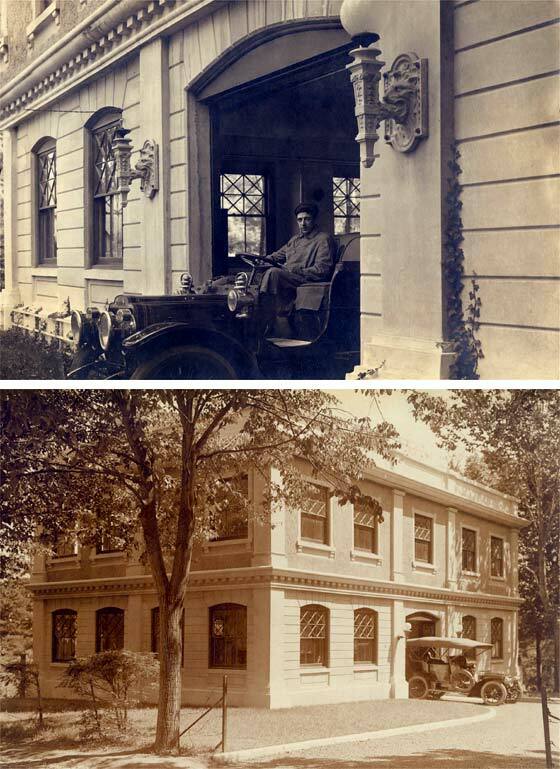 Two photos received from Terje Pedersen (Norway) taken in the USA, Arlington, Massachusetts in July 1910 and June 1913. 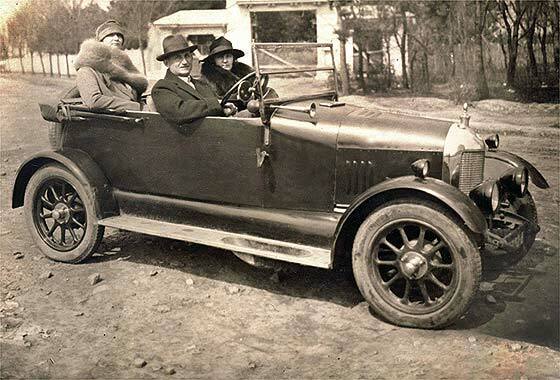 Drivers are his grand uncle Thorleif Sverre Cooke and his sister Hjørdis Pedersen. Thorleif was adopted by the widow Mary Jane Cooke from Cambridge Massachusetts, back right, who left him a fortune. 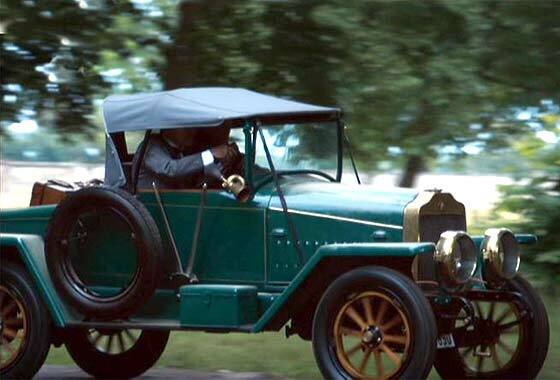 -- American car with distinctive humped bonnet and equally distinctive letter 'S' on the rad, with driver's door, together spell a cca 1910 Selden Model 35 Touring. Cinema screen grab of a vehicle which appeared in a German 2013 television drama series "Das Adlon: Ein Hotel. Zwei Familien. Drei Schicksale" where the vehicles are being investigated by IMCDB. -- Brennanbor was an 1871 German manufacturer of prams and bicycles, then motorcycles and later cars in Brandenburg. By 1908 they had their own racing team. 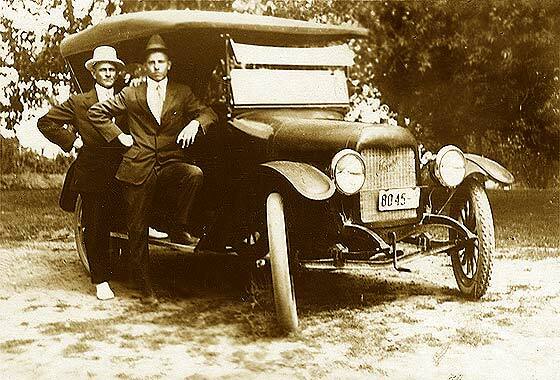 In the 1920s it was the largest manufacturer of cars in Germany. By 1945 the company ended up closing in the Soviet Zone. 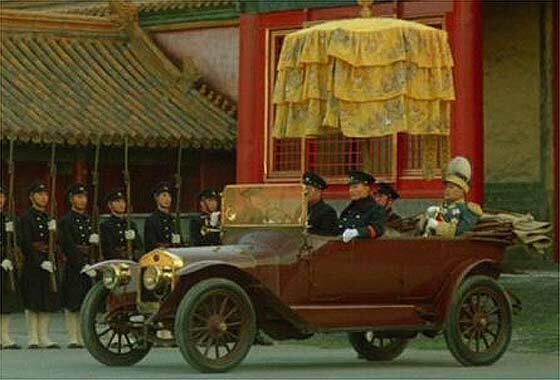 Cinema screen grab of a vehicle which appeared in 1987 Bernardo Bertolucci's epic 1987 film "The Last Emperor" where the vehicles are being investigated by IMCDB. Story depicts the life of Aisin-Gioro Pu Yi, the last of the Emperors of the Ching Dynasty of China. 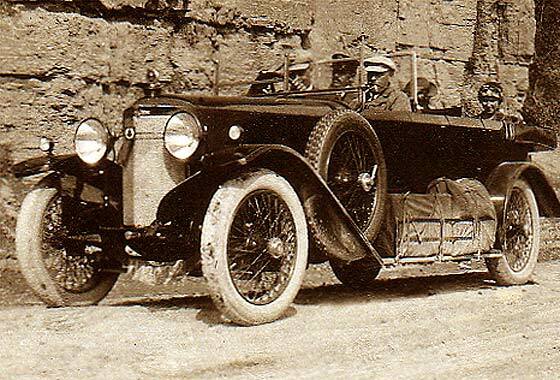 -- From the double section bulkhead and two filler caps on the more forward bulkhead which has a shallow slope, sideskirts and with gas lighting, this car is French and made near Paris, being a cca 1913 Delage AE Tourer. 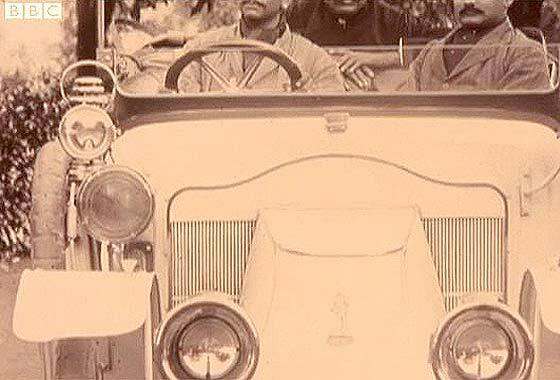 Cinema screen grab of a vehicle which appeared in a BBC documentary series made in 2008 "The Maharajas' Motor Car: The Story of Rolls-Royce in India" where the vehicles are being investigated by IMCDB. The car was named as a Renault. -- Although this does have a bulkhead mounted radiator it does also have quite visible the figure of Chevalier Pierre Terrail, seigneur de Bayard, on the front of the bonnet. This is the logo of a cca 1913 Clement Bayard, possibly a partitioned Landaulette. 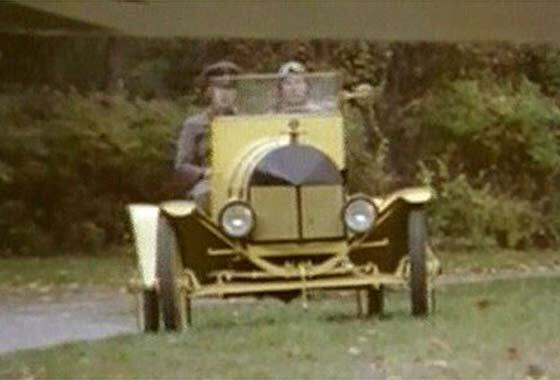 Cinema screen grab of a vehicle which appeared in a French documentary series made in 1996 "Les avions de la première guerre mondiale 1917-1918" where the vehicles are being investigated by IMCDB. -- Although this car looks quite exotic it is actually one of the world's most popular cars with a different front; a Special. The transverse spring is the giveaway and if the rounded bonnet and electric lighting are a guide, - a cca1916 Ford Model T Speedster Special. Another photo from Tom Cosens (UK) who says they are poscard curiosities needing identification. Apparently judging from the back of the card, this could be American. -- Sure is. Striking 'widow's peak' type of radiator helps to limit the choice. This type of rad was used for a short time by the Maxwell Motor Comany which was at that time in the top three of US car manufacturers. This is a cca 1917 Maxwell 25 Touring. Shortly after, Walter Chrysler took over and became Chysler. Another car from a batch of photos received from Philip Degen (UK) who has seen a reference to us in the Essex Family Historian. Wife has inherited an album which does not appear to be family and they are trying to trace who they were. -- Very fuzzy small pictures taken at a very difficuly angle and with the door open. Not at all easy to see, let alone identify. 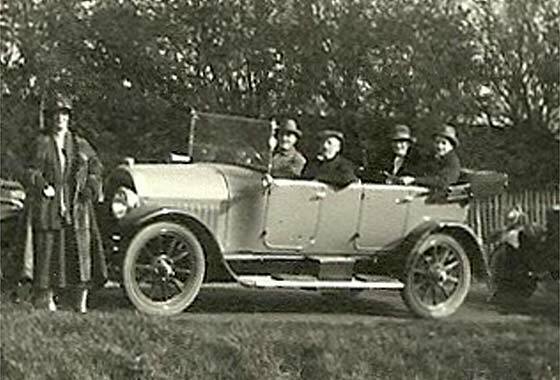 Nevertheless, we feel this could be a cca 1921 Calthorpe Minor 10HP Two-seater with a Landaulette body/roof and Dickey Seat. From a batch of photos received from Philip Degen (UK) who has seen a reference to us in the Essex Family Historian. Wife has inherited an album which does not appear to be family and they are trying to trace who they were. -- Very unusual car and not easy to identify. No registration visible to help with dating but our John Warburton is relatively sure this is a cca 1921 FN 16HP Tourer. Belgian car probably purchased through F N (England) Ltd located in Willesden, W. London. Photo posted on the Prewarcar website by Neil asking if anybody had an idea of what the car in this photo may be? 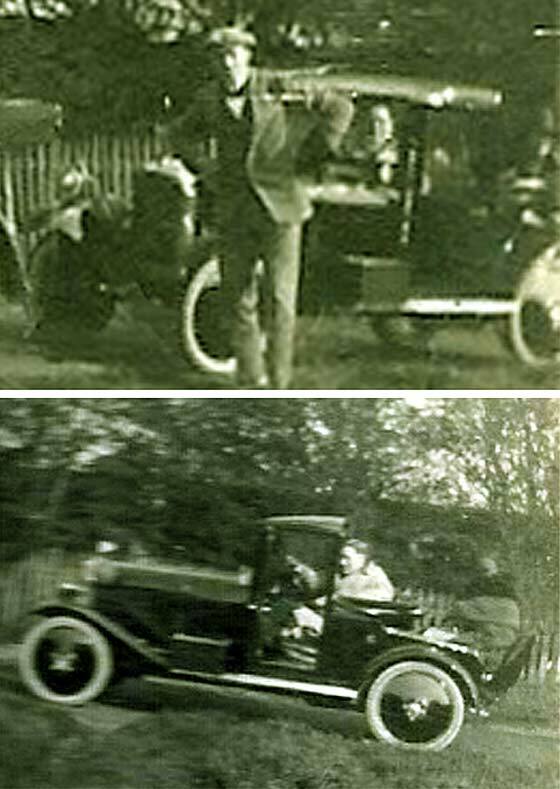 The man in the car was his great grandad. The photo could possibly be taken in South Africa or Australia if that helps! -- Not really as neither country was big in car manufacturing. The photo however is very helpful because when enlarged and enhanced the kick plates on the side car and wheels have a logo which advises this is an American cca1922 Chandler Six Dispatch. Interesting photo received from Rosalind Govett (UK) Eastbourne 1927, top right Mother and middle Grandmother. -- The logo on the rear wheel is quite clear indicating a stylised WK. This is a cca 1923 Willys Knight Model 64 Five Person Sedan. Willys Knight cars were introduced in 1914 and in 1916 made more than any car in the world. Eventually 330,000 were produced. The 'Knight' comes from the unusual licensed sleeve valve engine also used by Daimler, Mercedes, Voisin, Stearns & others. 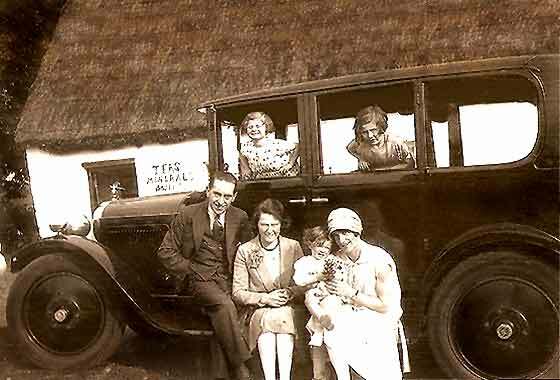 Photo posted on the Prewarcar website by Alain Labaume saying 'Hello, here a foto with grand aunt and uncle probably in Paris 1922. Type of this small car? -- Very small car produced in France between 1921 and 1924. 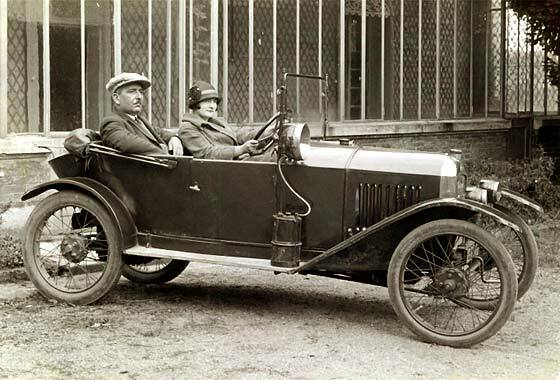 Earlier models, the 161, had tandem one-behind-the other seating, whereas this, being a cca 1923 Peugeot Quadrilette 172 Two Seater Torpedo, had staggered side by side seating. Car had rounded mudguards rather than flat ribbed, and had a gas generator and lamps. 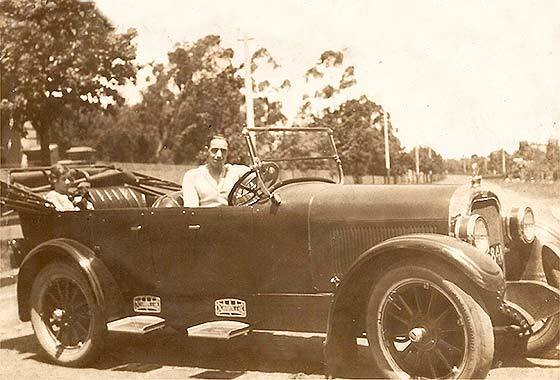 Photo posted on the Prewarcar website by Nicholas van Dijk asking for identification. This picture was taken in 1916 on the road from Porta Westfalica to Bad Pyrmont in Germany. 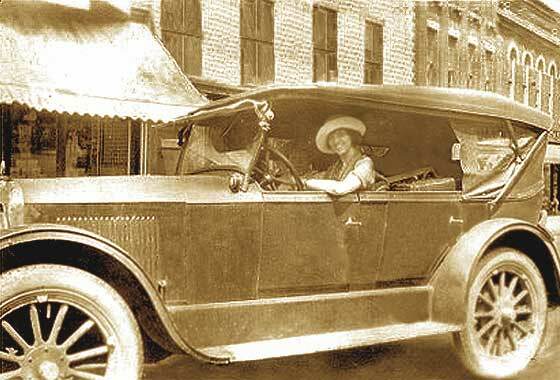 -- I think the photo may have been mis-dated, hence has remained unidentified, because this looks very much like a cca 1924 Austro Daimler Tulip Bodied Phaeton, could be a 60HP. Austro Daimler was by that time independant of Daimler Germany, and had Ferdinand Porsche as technical brains. Closed 1934. 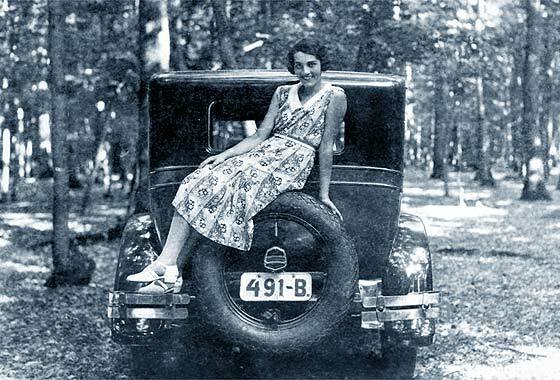 Another from a lovely batch of photos received from Cicos Florin in Constanta by the Black Sea (Romania) who is interested in old cars of Romania. -- It is nice to receive a picture of a British car amongst the many Americans. Our Peter Seymour/Chas Moody confirm this is a Morris Bullnose, specifically a cca 1926 Morris Cowley Occasional Four ('Chummy' if Morris made body). Rear seats are small hinged, facing inwards, and are best suited for a couple of kids or good luggage space. Interesting photo received from Tim Gell (France). His aunt lived for 10 years on an island off Toulon called Isle du Levant but is not the lady in the photo. The chap was Marcel Lassalle who was the local taxi driver/builder/handyman and became aunt's companion until he died in WWll. A cousin advises possibly the only car on the island and possibly Renault. -- Transverse spring, polished rad, and four doors says cca 1926 Ford Model T Fordor Sedan. Model T production finished in 1927. 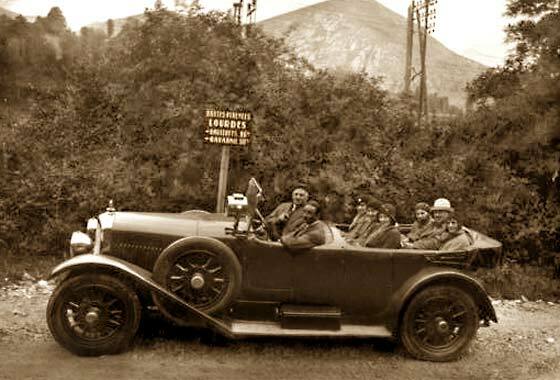 Couple of photos received from Adrian Pascu-Tulbure (UK) relating to a blog on historic cars of Romania. Numberplate of the newer car is same as the old one. Numbers were given to owners not cars. Low-numbered plate owners could pride themselves on having been very early vehicle owners. -- This back end shot would have been quite difficult to identify had it not been for the single rear lamp in the centre which has a distinctive 'widows peak' on top lense saying c1928 Buick Standard Six. 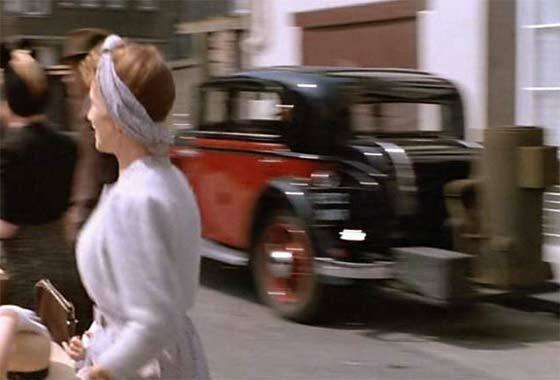 Cinema screen grab of a vehicle which appeared in a French film made in 1988 "Une Affaire de Femme" (A Story of Women) where the vehicles are being investigated by IMCDB. Action takes place during WW2. -- The car seems to be carrying a Gas Generator on the back which would be providing gas from wood being burnt. This looks like a dummy for film as there are now pictures of the same 1933 Hotchkiss 412 Cabourg Berline, with the same flashing indicators (??!! ), without it. 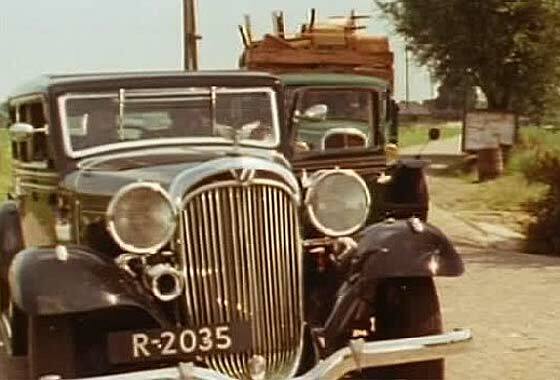 Cinema screen grab of a vehicle which appeared in a Dutch TV Mini Series made in 1990 "De Brug" where the vehicles are being investigated by IMCDB. Action takes place just before WW2. -- This is one of those 'easy when you know' identifications after much laborious searching recently on the same model of car, as onnear bottom of page 50. This is a cca 1933 Talbot Fulgur Model ME 75 Berline. The Fulgur was the top of range of Talbot France cars, prior to takeover by Tony Lago. 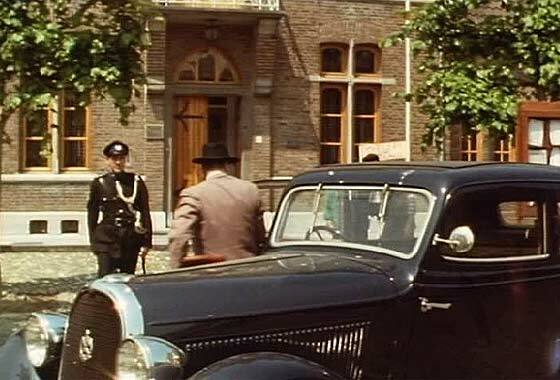 Cinema screen grab of a vehicle which appeared in a Dutch TV Mini Series made in 1990 "De Brug" where the vehicles are being investigated by IMCDB. Action takes place just before WW2. -- The badge on the radiator is quite clear so this is a cca 1935 Hotchkiss 411 Cabourg Berline. Hotchkiss was a French arms manufacturer who made cars 1903 to 1955. Merged with Delahaye 1954. Cars stopped 1955, then built Jeep. Military vehicles/trucks were made as recently as 1971. Blurry small photo received from John Gibbons (UK) taken in 1929. His wife's mother and aunt were on a pilgrimage to Lourdes.-- Picture is too blurry to provide accuracy in identification. We asked for photo at BEST RESOLUTION possible, as it is the detail that provides the identification. Regretfully we received no answer. This could be one of a number of French quality Tourers with pointy rads and two-section cab including La Buire, Unic, Alba, Delahaye, Panhard, Rolland Pillain, Delaunay, DFP... .
Rather fuzzy photo received from Dan Gillitzer (USA) taken in USA, which he is trying to identify. He feels it may be a 1920 Studebaker. -- I too felt this was a Studebaker but our friends at the AACA are relatively sure it is not. Period ones had suicide front doors. Thoughts that mudguards with edges date it to cca 1918/19. Hubs may have a W on them. Wheelstuds more on front than back? Various names have been foward including Buick, Wescott and Commonwealth. Unresolved! Fascinating photo received from Martina Dei (Italy) from the archives of Count Silvio Piccolomini of Pienza (Siena, Italy). The photo was taken probably in 1914/15 in Rome. Can we help in identifying the car. -- Not a good start to the new year. The logo is tantalizingly too blurred even on the original to make out. Very unusual rear suspension. Gas lights reversed during day. Shape of the rad is generally common to Italian cars ( Fiat, Alfa, CMN ...). Bit big for a Temperino. Any ideas anyone ? ?